This antibody recognises the phosphorylated serine found in the amino acid 2 position of the C-terminal domain repeat YSPTSPS. Synthetic peptide conjugated to KLH derived from within residues 1600 - 1700 of Saccharomyces cerevisiae RNA polymerase II CTD repeat YSPTSPS, phosphorylated at S2. This antibody gave a positive signal in Hela Whole Cell Lysate and S.cerevisiae extract. IHC-P: Human pancreas and tonsil tissue, mouse and rat kidney tissue. ICC-IF: MCF7 cells. Our Abpromise guarantee covers the use of ab5095 in the following tested applications. ChIP/Chip Use at an assay dependent concentration. WB Use a concentration of 1 µg/ml. Detects a band of approximately 240 kDa (predicted molecular weight: 217 kDa).Can be blocked with S. cerevisiae RNA polymerase II CTD repeat YSPTSPS (phospho S1606 + S1613) peptide (ab12793). CHIPseq Use 2-0.3 µg for µg of chromatin. DNA-dependent RNA polymerase catalyzes the transcription of DNA into RNA using the four ribonucleoside triphosphates as substrates. Largest and catalytic component of RNA polymerase II which synthesizes mRNA precursors and many functional non-coding RNAs. Forms the polymerase active center together with the second largest subunit. Pol II is the central component of the basal RNA polymerase II transcription machinery. It is composed of mobile elements that move relative to each other. RPB1 is part of the core element with the central large cleft, the clamp element that moves to open and close the cleft and the jaws that are thought to grab the incoming DNA template. At the start of transcription, a single-stranded DNA template strand of the promoter is positioned within the central active site cleft of Pol II. A bridging helix emanates from RPB1 and crosses the cleft near the catalytic site and is thought to promote translocation of Pol II by acting as a ratchet that moves the RNA-DNA hybrid through the active site by switching from straight to bent conformations at each step of nucleotide addition. During transcription elongation, Pol II moves on the template as the transcript elongates. Elongation is influenced by the phosphorylation status of the C-terminal domain (CTD) of Pol II largest subunit (RPB1), which serves as a platform for assembly of factors that regulate transcription initiation, elongation, termination and mRNA processing. Acts as an RNA-dependent RNA polymerase when associated with small delta antigen of Hepatitis delta virus, acting both as a replicate and transcriptase for the viral RNA circular genome. Belongs to the RNA polymerase beta' chain family. The C-terminal domain (CTD) serves as a platform for assembly of factors that regulate transcription initiation, elongation, termination and mRNA processing. The tandem heptapeptide repeats in the C-terminal domain (CTD) can be highly phosphorylated. The phosphorylation activates Pol II. Phosphorylation occurs mainly at residues 'Ser-2' and 'Ser-5' of the heptapeptide repeat and is mediated, at least, by CDK7 and CDK9. CDK7 phosphorylation of POLR2A associated with DNA promotes transcription initiation by triggering dissociation from DNA. Phosphorylation also takes place at 'Ser-7' of the heptapeptide repeat, which is required for efficient transcription of snRNA genes and processing of the transcripts. The phosphorylation state is believed to result from the balanced action of site-specific CTD kinases and phosphatases, and a 'CTD code' that specifies the position of Pol II within the transcription cycle has been proposed. Dephosphorylated by the protein phosphatase CTDSP1. Among tandem heptapeptide repeats of the C-terminal domain (CTD) some do not match the Y-S-P-T-S-P-S consensus, the seventh serine residue 'Ser-7' being replaced by a lysine. 'Lys-7' in these non-consensus heptapeptide repeats can be alternatively acetylated, methylated and dimethylated. EP300 is one of the enzyme able to acetylate 'Lys-7'. Acetylation at 'Lys-7' of non-consensus heptapeptide repeats is associated with 'Ser-2' phosphorylation and active transcription. It may regulate initiation or early elongation steps of transcription specially for inducible genes. Methylated at Arg-1810 prior to transcription initiation when the CTD is hypophosphorylated, phosphorylation at Ser-1805 and Ser-1808 preventing this methylation. Symmetrically or asymmetrically dimethylated at Arg-1810 by PRMT5 and CARM1 respectively. Symmetric or asymmetric dimethylation modulates interactions with CTD-binding proteins like SMN1/SMN2 and TDRD3. SMN1/SMN2 interacts preferentially with the symmetrically dimethylated form while TDRD3 interacts with the asymmetric form. Through the recruitment of SMN1/SMN2, symmetric dimethylation is required for resolving RNA-DNA hybrids created by RNA polymerase II, that form R-loop in transcription terminal regions, an important step in proper transcription termination. CTD dimethylation may also facilitate the expression of select RNAs. Among tandem heptapeptide repeats of the C-terminal domain (CTD) some do not match the Y-S-P-T-S-P-S consensus, the seventh serine residue 'Ser-7' being replaced by a lysine. 'Lys-7' in these non-consensus heptapeptide repeats can be alternatively acetylated, methylated and dimethylated. Methylation occurs in the earliest transcription stages and precedes or is concomitant to 'Ser-5' and 'Ser-7' phosphorylation. Ubiquitinated by WWP2 leading to proteasomal degradation (By similarity). Following UV treatment, the elongating form of RNA polymerase II (RNA pol IIo) is ubiquitinated UV damage sites without leading to degradation: ubiquitination is facilitated by KIAA1530/UVSSA and promotes RNA pol IIo backtracking to allow access to the nucleotide excision repair machinery. 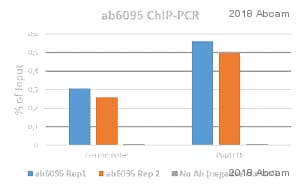 ab5095 at 4ug/ml in ChIP of RAW macrophages. Nuclear cell lysate of mouse RAW macrophages (expressing c-fms) were formaldehyde cross linked and ChIP tested with ab5095. The nuclear preparation was frozen before sonication with a probe sonicator. 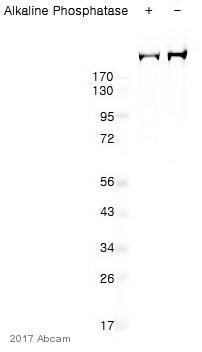 All buffers used contained protease inhibitors. 3T3 fibroblasts (not expressing c-fms) were used as the negative control. Immunohistochemical analysis of paraffin-embedded rat kidney tissue labeling RNA polymerase II CTD repeat YSPTSPS (phospho S2) with ab5095 at 1/1000 dilution, followed by Goat Anti-Rabbit IgG H&L (HRP) (ab97051) at 1/500 dilution. Weak nuclear staining on epithelium cells and glomerulus cells of rat kidney was observed. Counter stained with Hematoxylin. Perform heat mediated antigen retrieval using Tris/EDTA buffer, pH9. ab5095 stained in MCF7 cells. Cells were fixed with 100% methanol (5 min) at room temperature and incubated with PBS containing 10% goat serum, 0.3 M glycine, 1% BSA and 0.1% triton for 1h at room temperature to permeabilise the cells and block non-specific protein-protein interactions. The cells were then incubated with the antibody ab5095 at 1µg/ml and ab7291 (Mouse monoclonal [DM1A] to alpha Tubulin - Loading Control) at 1/1000 dilution overnight at +4°C. The secondary antibodies were ab150120 (pseudo-colored red) and ab150081 (colored green) used at 1 µg/ml for 1 hour at room temperature. DAPI was used to stain the cell nuclei (colored blue) at a concentration of 1.43 µM for 1hour at room temperature. Immunohistochemistry (PFA perfusion fixed frozen sections) - Anti-RNA polymerase II CTD repeat YSPTSPS (phospho S2) antibody - ChIP Grade (ab5095)This image is courtesy of an Abreview submitted by Karine Thibault. Ab5095 staining RNA polymerase II CTD repeat YSPTSPS (phospho S2) in Rat Brain tissue sections by IHC-FoFr (PFA perfusion fixed frozen sections). Tissue was fixed with paraformaldehyde and samples were incubated with primary antibody (1/3000 in 0.3% PBS-T) for 18hours at 20°C. An Alexa Fluor® 488 Anti-IgG Mouse polyclonal was used as the secondary antibody at 1/1000 dilution. Diluted ab5095 was bound to immobilised phospho- or control peptides (1 microgram per mL). The antibody was detected by goat anti-rabbit IgG (HRP) (ab97080; diluted 50000 times), and signal was developed by TMB substrate. Immunocytochemistry/ Immunofluorescence - Anti-RNA polymerase II CTD repeat YSPTSPS (phospho S2) antibody - ChIP Grade (ab5095)This image is courtesy of an Abreview submitted by Kirk Mcmanus. ab5095 staining RNA polymerase II CTD repeat YSPTSPS (phospho S2) in HeLa cells by ICC/IF (Immunocytochemistry/Immunofluorescence). Cells were fixed with paraformaldehyde and permeabilized with 0.5% Triton X100. Samples were incubated with primary antibody (1/200 in PBS) for 1 hour at 22°C. An Alexa Fluor® 488 conjugated Goat Polyclonal Anti-rabbit (1/200) was used as the secondary antibody. Immunohistochemical analysis of paraffin-embedded mouse kidney tissue labeling RNA polymerase II CTD repeat YSPTSPS (phospho S2) with ab5095 at 1/1000 dilution, followed by Goat Anti-Rabbit IgG H&L (HRP) (ab97051) at 1/500 dilution. Nuclear staining on epithelium cells and glomerulus cells of mouse kidney was observed. Counter stained with Hematoxylin. Immunohistochemical analysis of paraffin-embedded Human tonsil tissue labeling RNA polymerase II CTD repeat YSPTSPS (phospho S2) with ab5095 at 1/1000 dilution, followed by Goat Anti-Rabbit IgG H&L (HRP) (ab97051) at 1/500 dilution. Nuclear staining on human tonsil was observed. Counter stained with Hematoxylin. Immunohistochemical analysis of paraffin-embedded Human pancreas tissue labeling RNA polymerase II CTD repeat YSPTSPS (phospho S2) with ab5095 at 1/1000 dilution, followed by Goat Anti-Rabbit IgG H&L (HRP) (ab97051) at 1/500 dilution. Nuclear staining on epithelium cells and pancreas islet cells of human pancreas was observed. Counter stained with Hematoxylin. IHC - Wholemount of Caenorhabditis elegans larvae labelling RNA polymerase II CTD repeat YSPTSPS (phospho S2) with ab5095. The sample was incubated with primary antibody (1/500 in PBS + 3% BSA + 0.1% Triton X-100) for 12 hours at 4°C. ab150077, an goat anti-rabbit Alexa Fluor® 488 (1/1000), was used as the secondary antibody. Publishing research using ab5095? Please let us know so that we can cite the reference in this datasheet.